So today is reveal day and there is loads of excitement in the air in our house! We are finally able to show all the details of our Industrial Teenage Bedroom Makeover on a Budget and it’s a showstopper! I may or may not be tearing up while I type this. I know that my son is only 14 and we have lots of years ahead of us with him in our home, but there’s a finality to this makeover that is tugging at the heart strings. We’ve always done theme rooms for our boys. From a dragon fighting castle theme, to a dinosaur room complete with painted mountains. Then there was the Star Wars Room and the Train Room. I’m kicking myself for neglecting the boys rooms these past 4 years while we were fixing up our Almost Farmhouse, because now the time is slipping away with my gentle giant. This will probably be the last theme room I make for him. Oh – and there are the tears again! But let’s focus on the happy things for a moment. So let’s go week by week on how transformed this room in 6 weeks time. This week was all about the room in it’s ‘before’ state and the plan we had – which wasn’t really there – and that completely goes against my planner-self. So we sort of winged it as we went along and I’m so pleased it worked out! Even though we had a bumpy start making over this room when we started painting, laughs were shared and hugs were doled out. But most importantly, memories were made. We were able to update my gentle giant’s closet for just under $40 by using scrap wood we had in our garage. And it’s a huge bonus that we can fit his tall clothes. 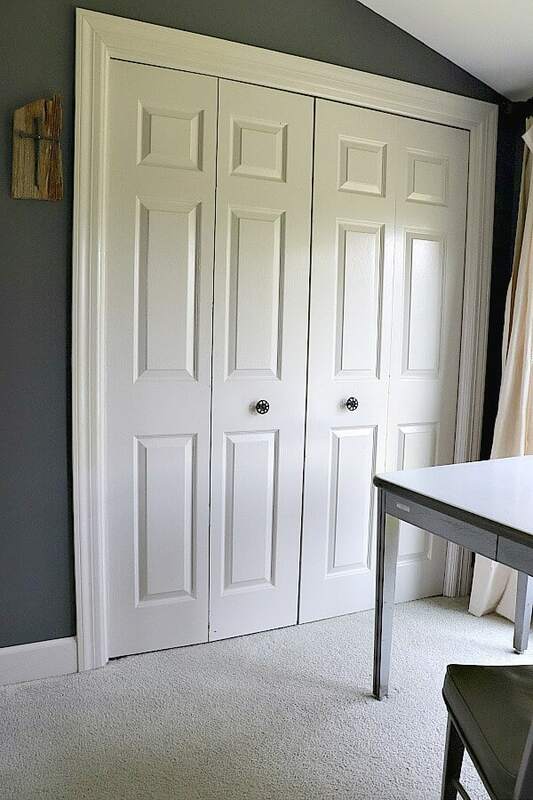 Not to mention – I’m over-the-moon that we finally have those closet doors rehung after 3 years! The curtains were the easiest no sew project to date and they match wonderfully with his frayed edge bedding we found on clearance at Walmart. 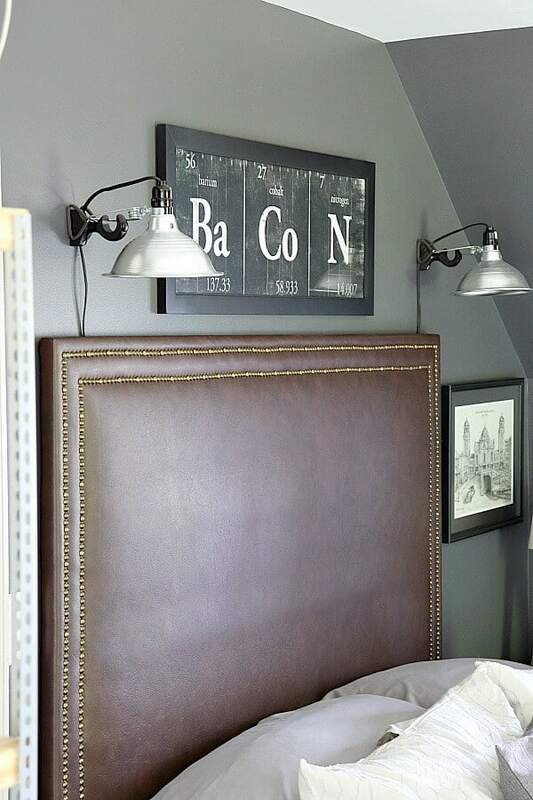 By repurposing our first DIY, we were able to create a manly headboard with easy DIY wall reading lights. Because we were operating on a budget, we also saved loads on furniture by reusing wood in our garage to make a new shelving unit for our son. 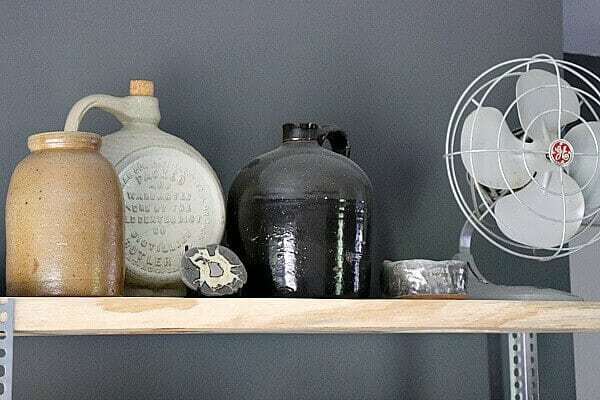 I was able to find vintage items around our house that had that industrial feel to style the shelves. See that jug in the middle with the embossed print? That was my gr.gr. granddaddy’s hooch jug found years after his death buried in the barn. Seems like he would sneak away to get a snoot full. Our feature corner is my son’s favorite space. 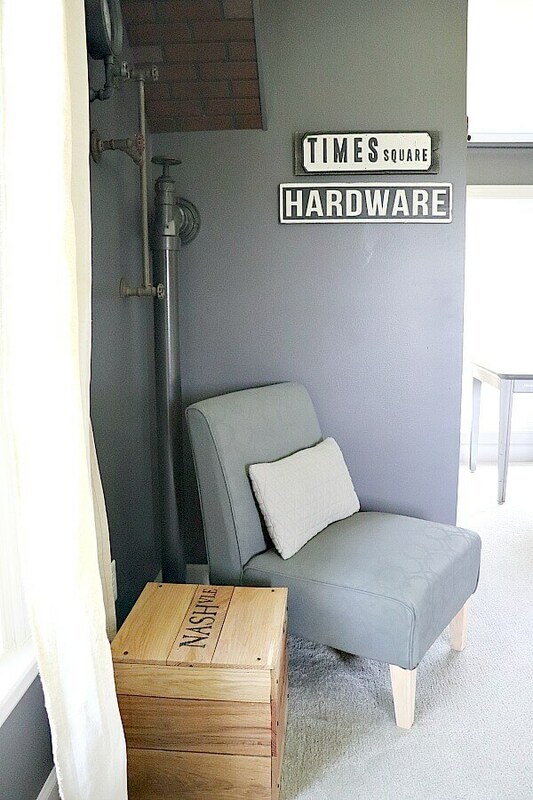 The pipe walls were an easy DIY and we partnered with Liberty Tree Creations with this amazing shipping crate for his room. Since he’s a history buff, my son loved all the details put into this replicated crate. I was even given Cool Mom Cred on the Faux Pipe Feature Wall. If only you could put that on a resume! Now let’s get to my favorite part – the decorating! We made these DIY sawhorse lamps (tutorial coming soon) and they add to that industrial feel we were hoping for in this room. I found the posters in his room in the Clearance bin at Hobby Lobby and got both for $10! I love how they look – don’t you? Because my son is ‘punny’ I knew he would LOVE the Ba Co N poster. It’s perfect for his humor. 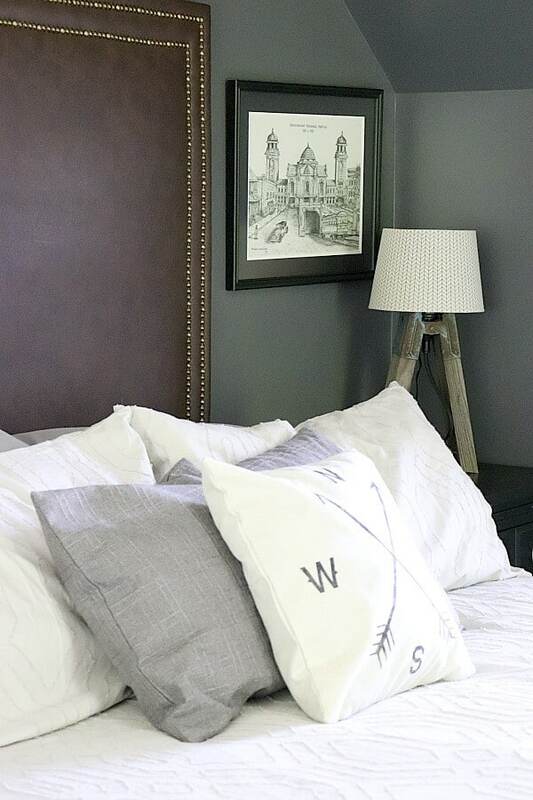 The artwork next to his bed is a pen and ink that his grandfather made and the framed photos are from my husband’s travels when he used to tour as a drummer. 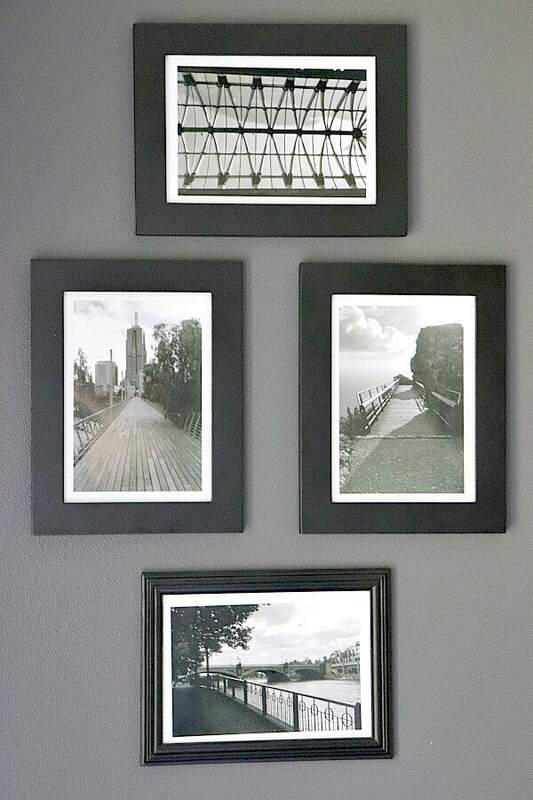 I love that we can add that touch of sentimentality to the room. The dormer window nook remained as his music area. 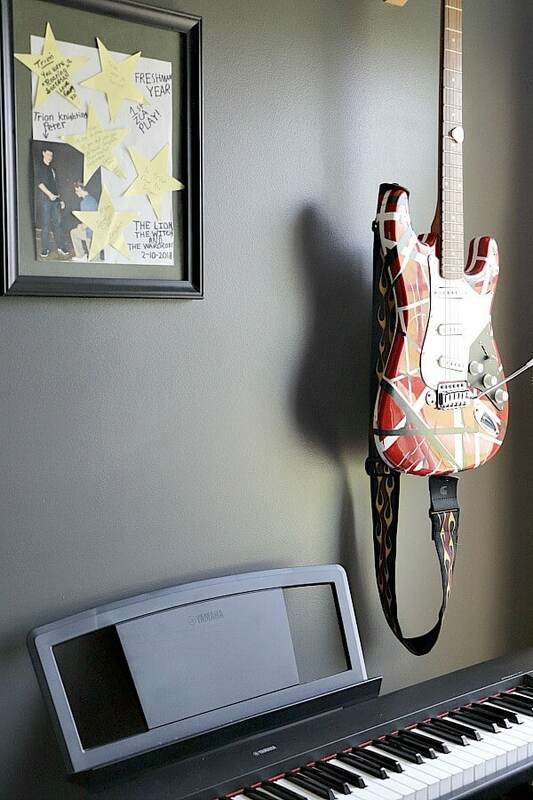 We hung his guitar and framed memories from his first theater performance. 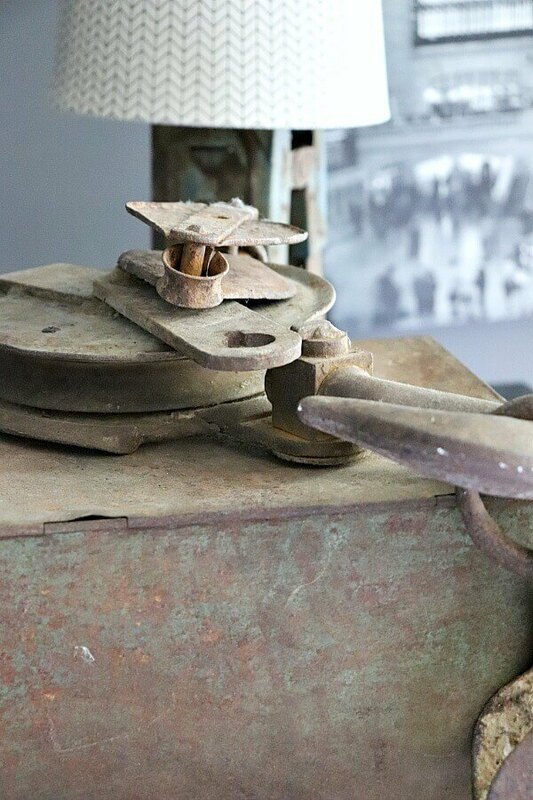 We searched our garage and my decor stash to find rusty, manly things like hooks, pulleys and tin boxes. 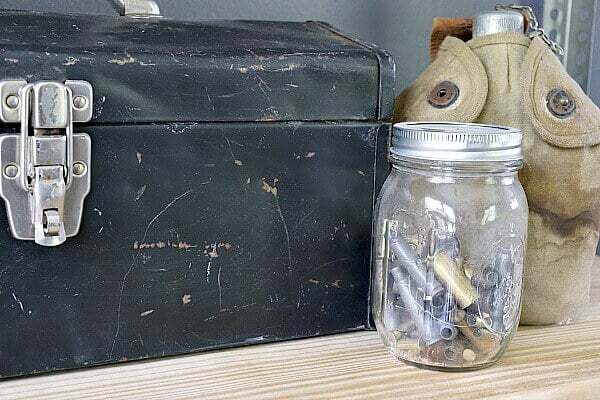 The jar full of used bullet casings is my son’s ‘souvenir’ from years ago when we lived in Vegas. When we hiked in the mountains, he would collect any casing he found and put them in a jar. Of course, they fit perfectly in his industrial room. Since my son dreams of being a writer when he grows up, we kept this old desk in his room so he can write his Magnum Opus. He loves to look out his window while he works. 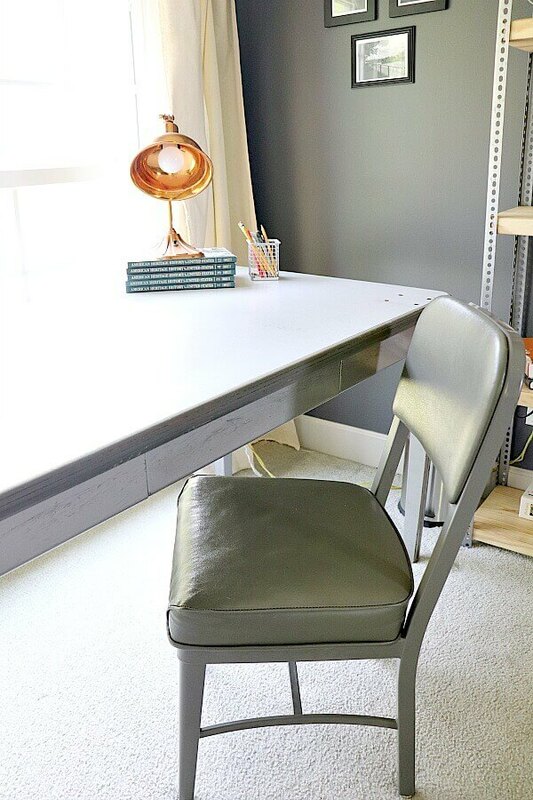 I brought in a chair we had in our recording studio – it was the perfect fit for this space. 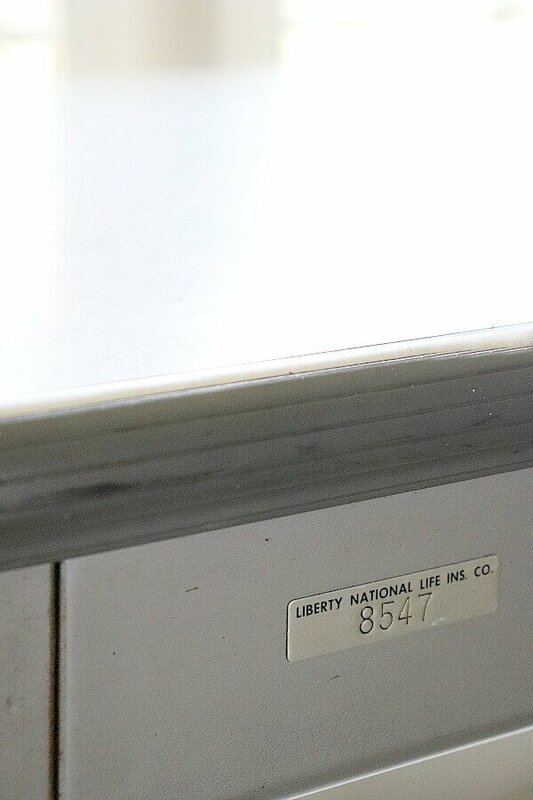 We hung an enamel coated metal light over the desk to provide industrial lighting. 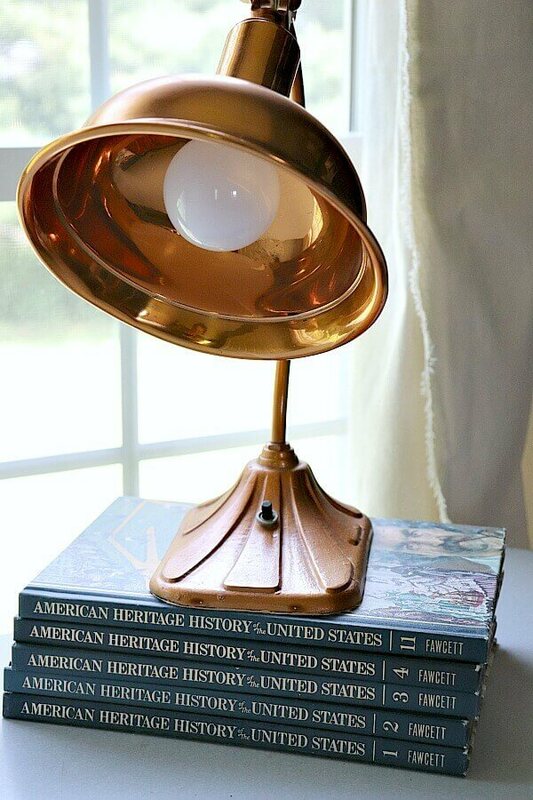 Finally we completed the look with a vintage copper lamp that was in my in-law’s attic. 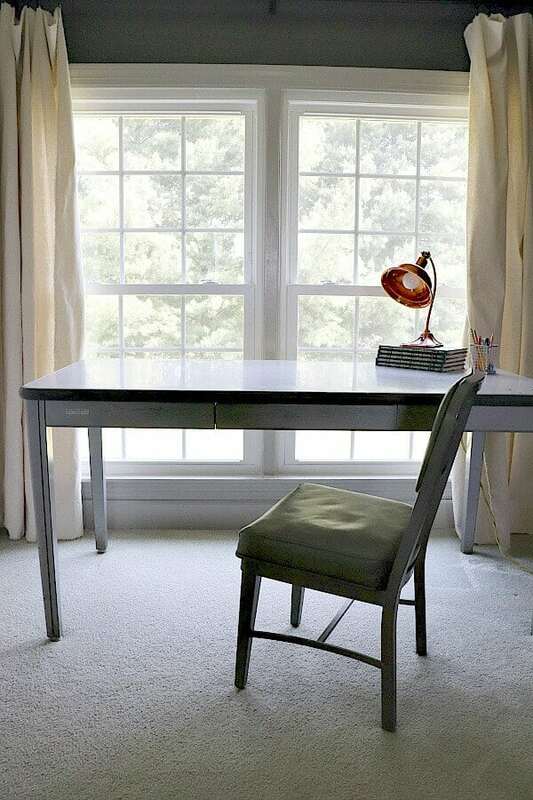 Certainly a space for inspiration, don’t you think? So now let’s look at some before and afters! 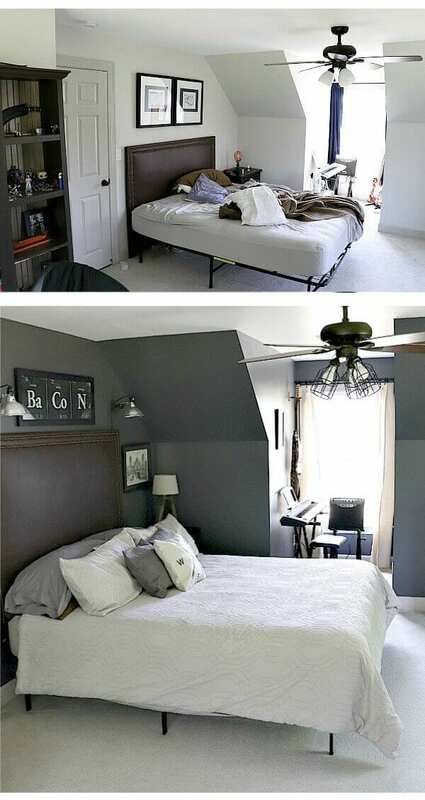 What a difference and most importantly – my son LOVES his updated room. No, we weren’t able to replace the carpet like I had hoped, but we were able to create a space that he will enjoy for the rest of the years under our roof. Oh boy – there are those tears again! So, let’s crunch numbers and see what the total cost of this makeover came to. Affiliate links are provided for your convenience. My goal was to keep this between $200-400, and the faux pipe wall was a last minute feature my husband added as a bonus – well worth going over if you ask me! So now that we’re finished – I’m going to take a day and see all the other reveals. Of course, a huge thank you to Linda from Calling it Home for putting together another fabulous challenge. Be sure to head over to the One Room Challenge and check out the amazing reveals the other bloggers have made for yourself. This season was so much fun and I alway enjoy finding new ideas from other DIYers! Don’t miss another post! Join my email list so you get all the latest updates! I love that you did a teen boy’s room, and that he was so into it! I am feeling inspired! Wow… it looks amazing!! Love the color… and the details are so neat!! I can’t believe it was done under $500.00! Great job! I’ll bet he loves it!! It turned out AWESOME!! I bet he loves it!! 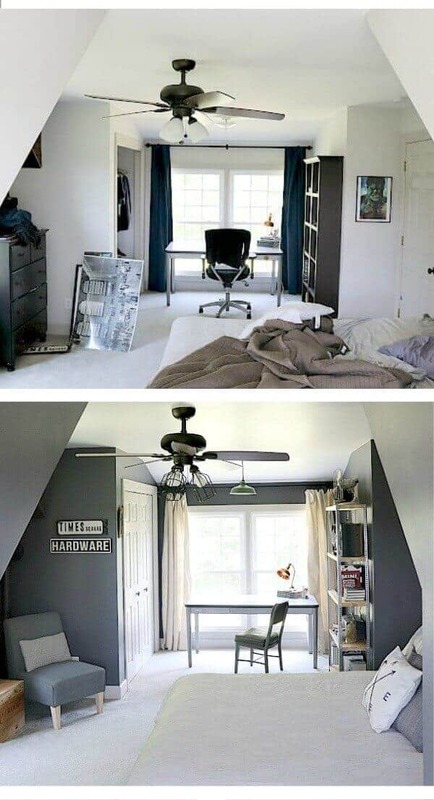 What a cool room! 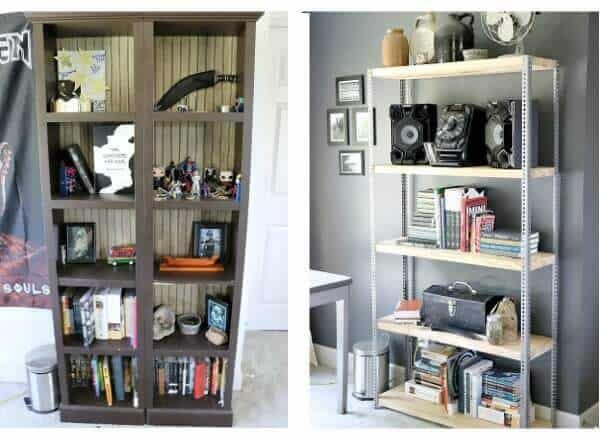 You’ve highlighted the nooks perfectly to make every bit of his room useful and FUN! 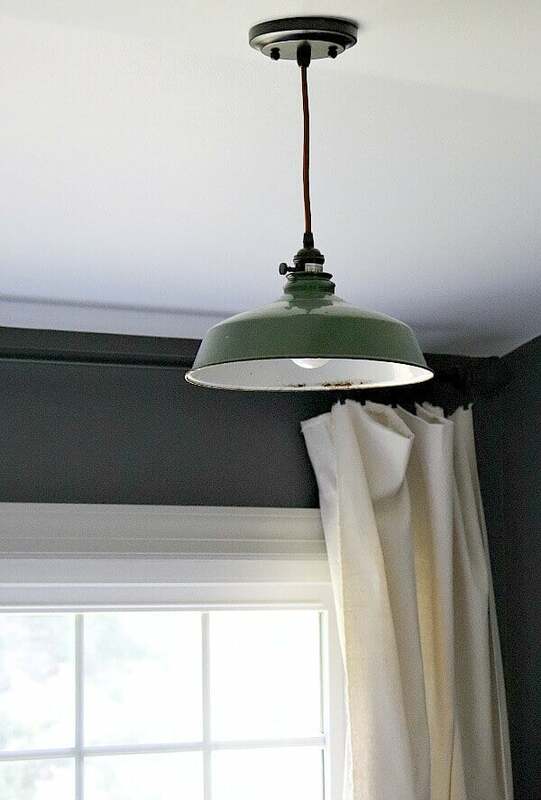 My favorite part might be the frayed drop cloth curtains. Job well done! I love the industrial feeling! It’s a perfect room for a teenager. And I can’t believe you did the whole thing for under $500. That’s awesome! This is perfect! I bet he loves!!!! it! 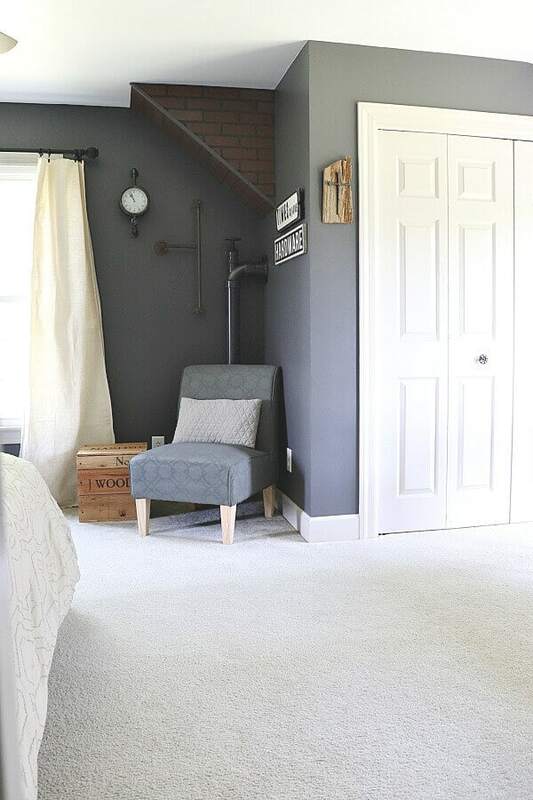 As a mom of two boys I got a little teared up reading your post too : ) This room is perfect for your young man and I love all of the industrial touches. Wonderful job and I hope he enjoys it! Jen this space is amazing!! Your son must be so fired up!! So many clever ideas, I just love it all!! I did my older teen son’s room for a previous ORC and I’ve been slowly working on my younger son’s room for literally 6 months…..seeing this all pulled together has me so motivated to finish it and bring some character to the space like you did in here!! It’s chock full and I love how meaningful the decor is (the music area, pen drawing, your great great grandfather’s hooch jug :), all so awesome!!!) Congratulations for getting all this done!!! Holy cow Jen! You did an amazing job! 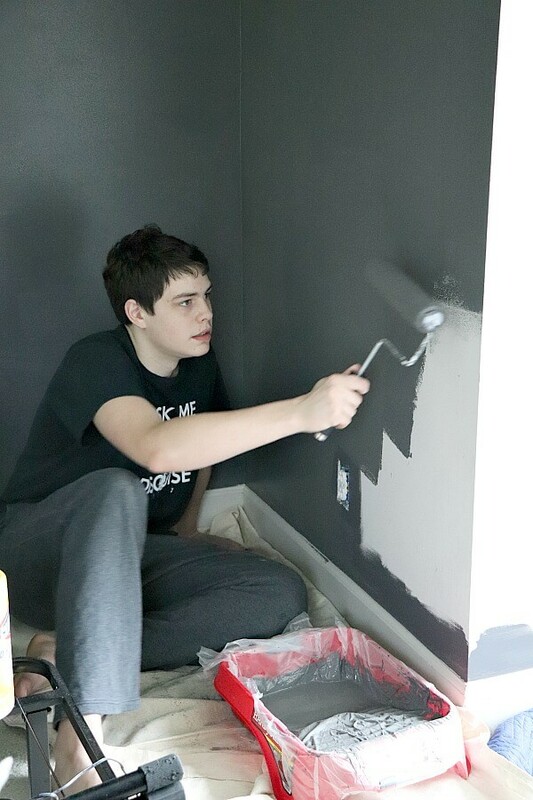 We know that it is bittersweet but how cool it was to make great memories with your son while re-doing this special room for him. He will treasure this for a lifetime, as will you! Well done! Way way way cool.. Them growing up in a flash does happen so I totally get it. 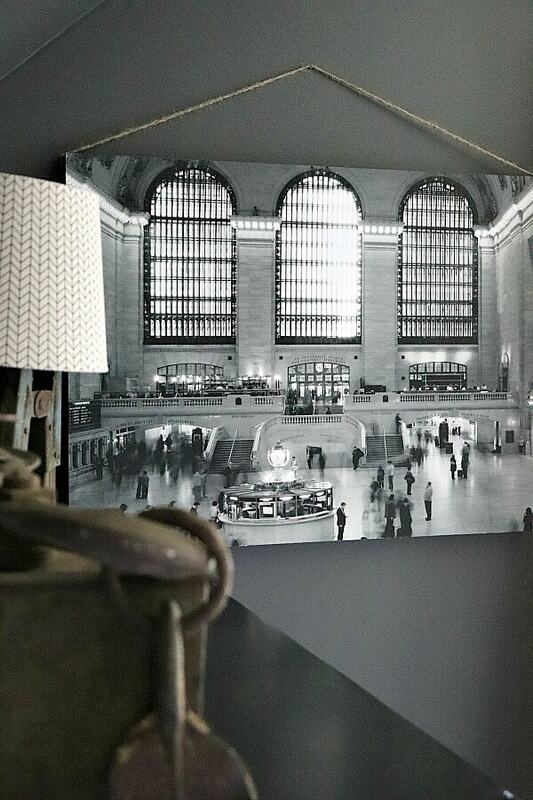 Love all the details on it….so my style. I always appreciate a good renovation on a budget! This is so good! This was our first time doing the ORC, I’m so glad we did it! So much fun! 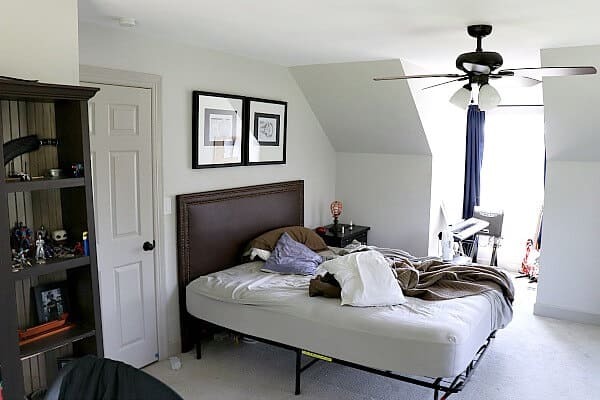 His room turned out amazing!! I love all of the sentimental items from your grandpa. I hope he gets a ton of writing done at that amazing desk!! Great job! Thank you so much Emy! It was a fun project to share with him! Hi Ashley! Thanks for taking the time to leave a comment. 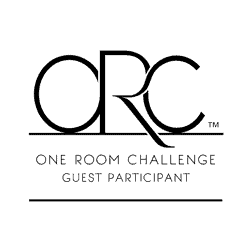 It’s always fun to connect to other bloggers through the ORC – this was our fourth time and I’m sure to be back for more! Thank you so much! It means the world coming from sweet friends like you! And who knows? Maybe I’ll be blessed enough to have him work side by side in the future like you all do! Thanks Julie! It was a fun project to share with him! Thanks so much! We are over the moon excited with the results! He does – and it was so special being able to share that special time with him! Thank you so much Erin! I love it when I get detailed comments and this one brought a smile to my face! Hi Wanda! He is loving all the masculinity in his room now! He’s growing up too fast! He really does, to the point that he even is keeping it straight and making his bed each morning! Aw! It’s a tender thing to think about isn’t it? He were so blessed to be able to share this project with him and he truly loves his room! Now our youngest wants his room done! Hi Lisa! 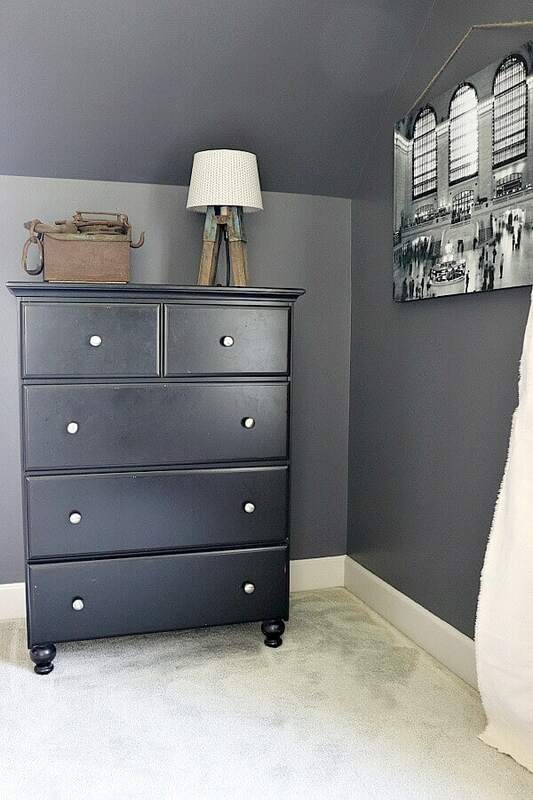 I’m so glad to hear that this inspired you to finish your other son’s room. Now my youngest is begging for us to transform his room! Looks like I may have to do that one this fall! Angela – You are so kind! It was a special time we definitely cherished – especially now that those ‘hang times’ are far and few between! What an awesome space! 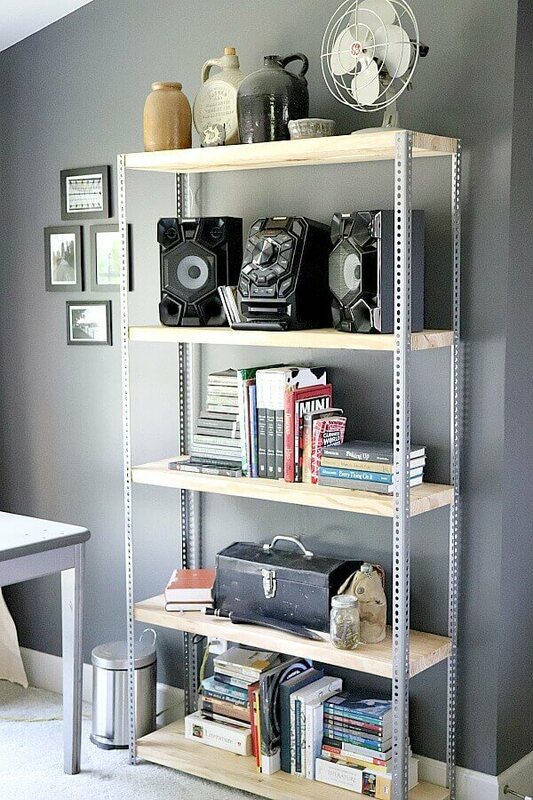 The pipe wall, the music nook, the new closet shelving….you did good! Jen this is such an awesome room for your son. I love how you incorporated history that he likes and things that are special to him. And the pipe wall is so cool! Well done! Oh I love it!! You did such an amazing job. 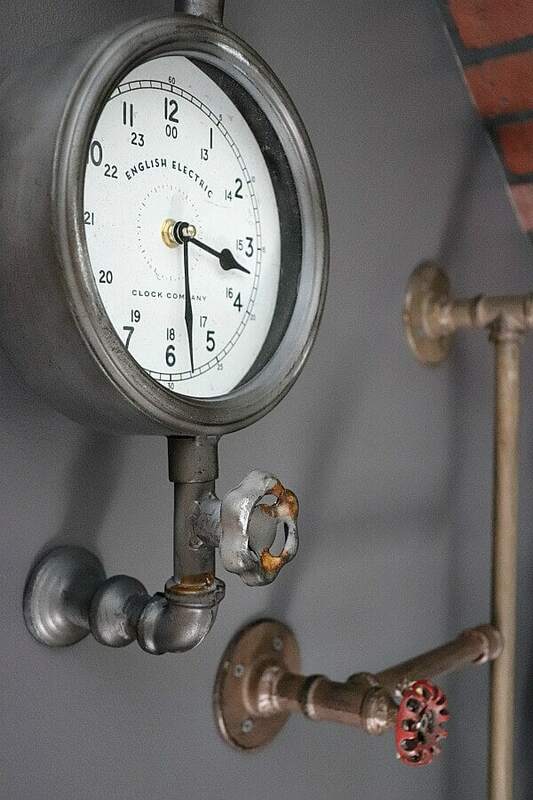 All the industrial elements are fantastic & the wall colour turned out beautiful. 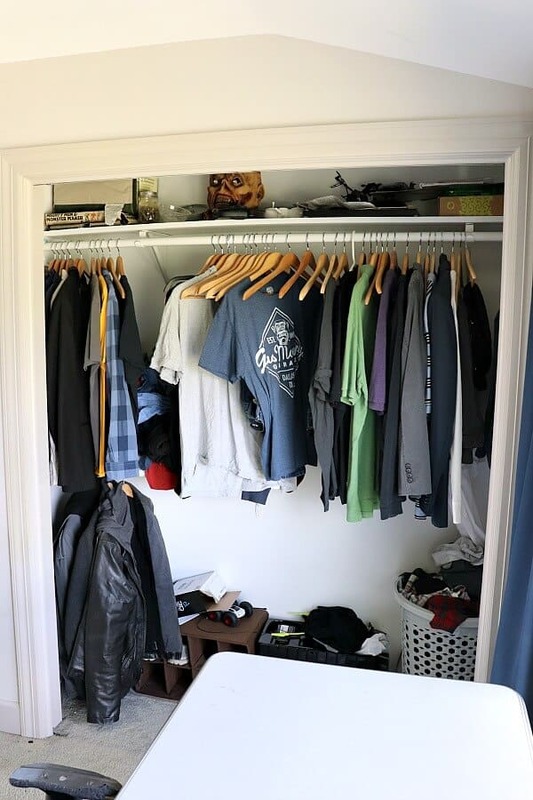 Your son must be so happy to have a well designed functional room! So so good!! 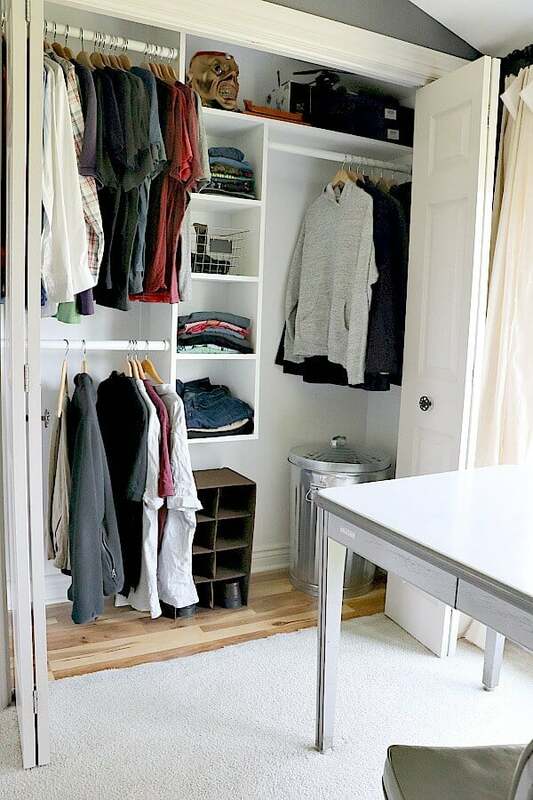 This is such an amazing space for your son! 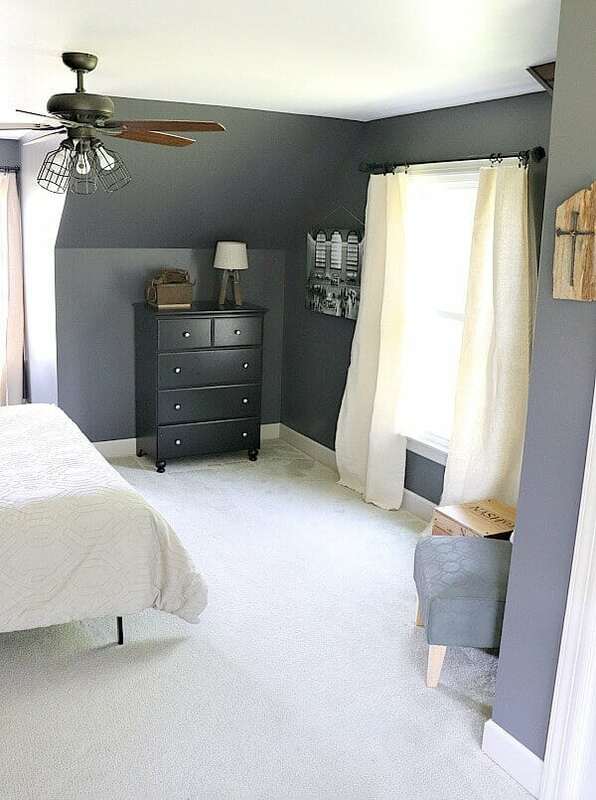 I was tearing up a bit thinking of how quickly time flies by and how soon I won’t have any kids around to redecorate (and redecorate again) their rooms anymore. 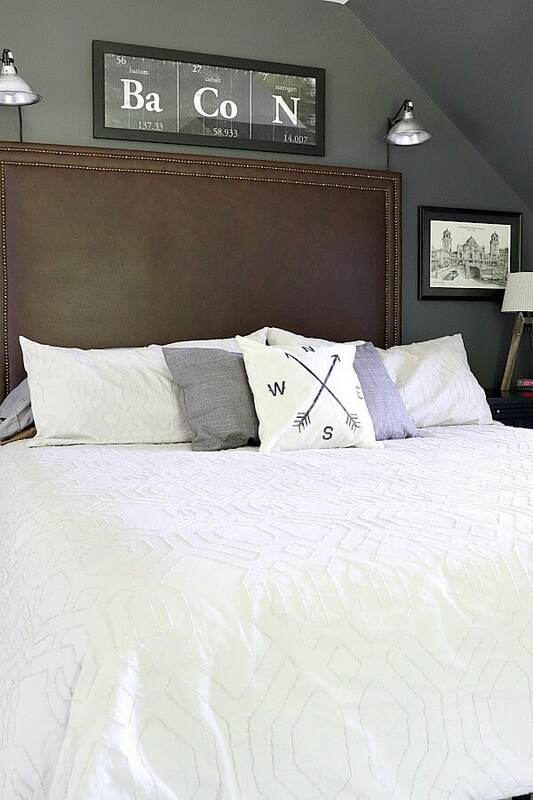 I love that you were able to work on the space together and bring in touches that are perfect for a teenage boy! I was surprised by (and adore) the faux pipe wall. It is such a quirky touch. The colour palette is wonderful: strong, masculine, yet neutral. 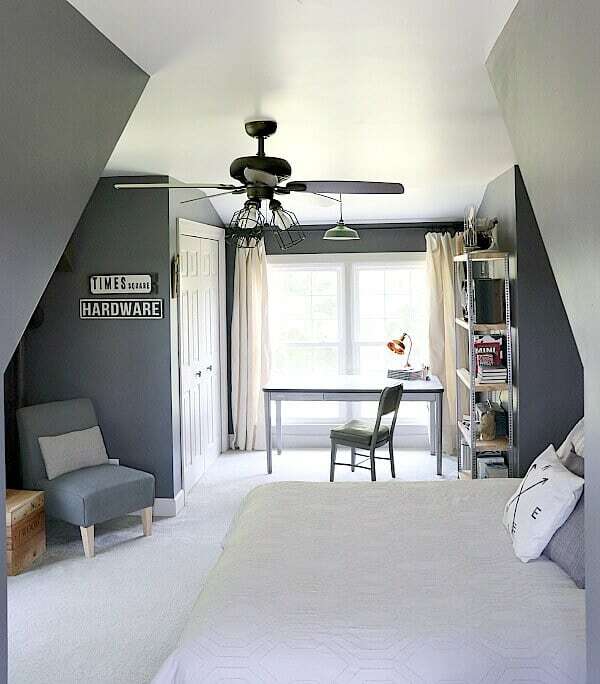 I really love what you did with this room! Jen it really looks cool! Perfect for a teen boy and just full of fun industrial pieces. Thank you Susanne! He is definitely enjoying his room – a little too much! Now, how to get him out of his room to spend a moment with me? I guess that’s the way it’s supposed to be, isn’t it? Cue the tears again! Thank you Pat! He certainly loves it! Thanks so much Jenny! It was a precious time together! I just LOVE the color and all those industrial touches. 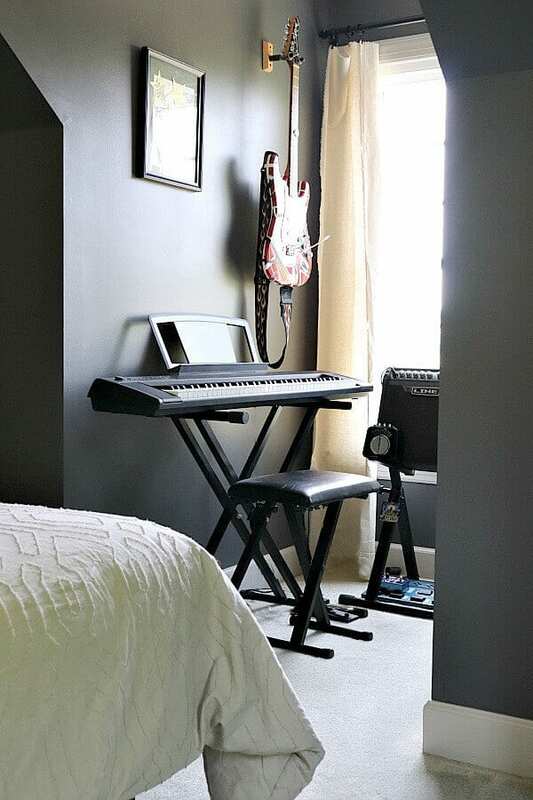 What a perfect bedroom for a teen boy. Thanks for sharing with us at the Summer Time Fun Linky. Pinned.